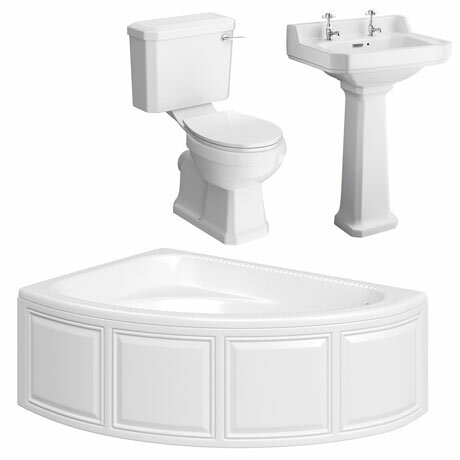 A stunning traditional styled close coupled toilet, 2 tap hole basin with full pedestal and offset corner bath and panel. Evoking the classical style of a bygone era, yet manufactured to today's high exacting standards, the Carlton bathroom suite is perfect for providing a period look in any home. Spacious yet compact, this offset corner bath offers exceptional design qualities, a deep bathing area and a comfortable seat for superb bathing comfort and maximum relaxation. Ideally suited to a more compact bathroom. Bath panel features a 4 edged panel design. Features a detailed rope edge. This incredibly strong and hard-wearing offset 5mm corner acrylic bath with front panel is excellent for family bathing, ideal for relaxation. Corner bath is available in a left or right hand option (Left hand shown). Good service great price help at the end of the phone.